Nikon Monarch 5 Binoculars Review: How do They Perform? Nikon Monarch 5 Binoculars: How do They Perform? Note: This is a review of the Nikon Monarch 5 binocular before it was updated to include objective lenses made of ED glass and other changes. This review will stay as a resource for anyone who is interested in the older model. If you're looking for information about the updated model, we've written a review of the new Nikon Monarch 5 ED binocular. We first learned about the Nikon Monarch 5 binoculars (known as the Monarch DCF MK3 outside the United States) while attending the Shot Show during January 2012. We were curious about what they were and how they might fit into the Nikon binocular lineup in the future. It was during those conversations that we understood that Nikon would be phasing out the Monarch ATB binoculars which had been popular for a number of years and replacing it with a numbered series of binoculars bearing the Monarch badge. It was an interesting idea that we thought might allow binocular users to buy good optics to fit a range of budgets. The newly badged Nikon Monarch 5 binoculars are a direct descendant from the former Monarch ATB binoculars with 42mm objective lenses. Those 42mm Monarch ATBs were the ones which had been fitted with dielectric prism coatings that were a step up from the others in terms of brightness, resolution, and so on. The new Monarch 5 binoculars have dielectric prism coatings and thus stand in the place of Monarch ATBs with 42mm objective, which had dielectric prism coatings prior to their discontinuance. The (also newly badged) Monarch 3 binoculars carry on the Monarch ATB tradition from prior to the introduction of dielectric prism coatings and use the silver alloy prism coatings characteristic of Monarch ATBs prior to the introduction of dielectric coatings for those with 42mm objective lenses. Having covered the basics for the Nikon Monarch 5 binoculars, shall we dig in and talk about how it's made and how it performs? As with the other binoculars in the new Monarch series, the chassis for the Monarch 5 is polycarbonate reinforced with fiberglass. It's a construction technique that provides sturdiness with light weight and Nikon has excelled with it over a period of time. Polycarbonate by itself is quite strong and reinforcing it with fiberglass enhances that durability at a weight that nearly all will be comfortable carrying. We found the balance of the Monarch 5 binoculars to be very good. It allowed us to use them for long periods without unduly fatiguing the arms or wrists. The barrels' outside diameter measures about 2in (5cm) — comfortable for both small and large hands to grip. They feel good, comfortable you might say, in one's hands and the forefinger rests comfortably and naturally on the focus wheel. The Monarch 5 binoculars are watertight in non-moving areas and the focus mechanism is sealed with O-rings and lubricants designed for the job. We advocate treating any binocular with the care and respect due a precision optical instrument. It's good to know, however, that they're waterproof should you be caught out in a shower or the binocular be accidently splashed. The owner's manual says that, although some rain or splashed water won't harm them, they should be wiped off as soon as possible. Being waterproof more or less automatically makes a binocular internally fog-proof, as well. While this keeps the binocular from fogging on internal lenses, it doesn't mean that condensation won't form on an external lens surface when taking them from an area with a cooler temperature to a warmer, more humid area. The external condensation is only a mild nuisance at worst and quickly disappears. To further guard against internal fogging and the fungal-growth that can occur with such internal humidity, the Monarch 5 binoculars have the potentially moisture-laden air molecules inside purged and replaced with dry nitrogen gas molecules. Replacing the air with a dry gas, such as nitrogen, is something that's typically done with most waterproofed binoculars. As are many binoculars at this point, the Monarch 5 binoculars are rubber armored with a layer of rubber to protect against bumps and scrapes. This is not what waterproofs the binocular. It's a relatively firm layer of rubber extending from the objective lens' end of the barrels up to just below the eyecups. In addition to protecting the binocular from moderate bumps and scrapes it also helps to deaden the sound of a finger ring&sol;wedding band on the binocular. Our Monarch 5 binocular's eyecups are great! There is no question about their losing position or accidently "self-adjusting" when they're being used as is the case with some binoculars. They have four positions: 1) fully retracted, 2) first increment is about 5mm, 3) second increment about another 3mm, and 4) fully extended at about 10mm. Nikon designed the Monarch 5's focus adjustment with real world use in mind and we're delighted! For focus mechanisms which have a linear adjustment, meaning that a quarter revolution of the focus wheel will change the focus about the same whether at close focus, mid-focus, or approaching infinity, we believe a single revolution of the focus wheel to go from close focus to infinity is optimal. This rate of adjustment will allow you to change focus quickly, but not so fast that you must fiddle with the focus wheel to achieve a fine focus. We're sufficiently flexible in our thinking, however, to be willing to accept as much as 1.5 revolutions of the focus wheel between close focus and infinity. At 1.5 revolutions, your focusing fingers will get more of a workout in conditions which require frequent adjustments for changes in viewing distance — but you'll likely survive. We consider your enjoyment of life in the hours after using an instrument requiring more than 1.5 revolutions from close focus to infinity to be more questionable! The Monarch 5's focus mechanism adjusts from close focus to infinity with just under 1.25 revolutions of the focus wheel. Yes, it's more than a single revolution, but less than 1.5 revolutions and we think it's a reasonable compromise if a compromise is required. For those long-time binocular users whose focus-wheel-turning-habit is firmly entrenched, the Monarch 5's wheel turns clockwise to go from close focus to infinity. As we used our Monarch 5 binocular in the field, we considered that a Nikon design team was likely responsible for Monarch 5 from concept to reality. We noticed a number of design features that we felt were typically Nikon and which contributed to our sense that this is a Nikon product. Stamped into the rubber armoring along the underside of the hinge is "Made in China." We suspect that Nikon has partnered with an optical manufacturing facility in China to the extent that it is able to exert control over its production quality. In this way, we believe, Nikon is able to maintain the reputation it has earned over the years while keeping costs (which means retail prices) under control. What Size is the Monarch 5 Binocular's Optical Sweet Spot? We were pleasantly surprised when we tested the Monarch 5 we bought for its "sweet spot" or the portion of its field of view for which details are all sharply focused. Usually, this is an area in the center of the field of view and, due to curvature, as one looks further from the center the details become soft and then tend to blur or become fuzzy. Since we never know exactly what we'll find when we start this test, it's always interesting. The view through the Nikon Monarch 5 binocular we had purchased was crisp and sharp out to about 71&percnt; of the radius of the field of view before we started to notice details softening. We went further, to about 86&percnt; from the center of the field of view before we felt the softening reached the point where it would begin to lose details. Please note that we could still see activity at that point — the view was still usable, but the details were not as sharply resolved as they were in the "sweet spot." 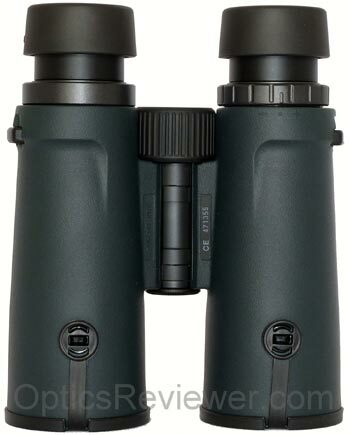 This binocular has phase correction coating and is fully multi-coated, which work together to resolve details. We'll talk more about the dielectric prism coatings in another paragraph or so and with many binoculars we've felt that dielectric reflective prism coatings work to enhance the resolution of details. With the Monarch 5 binoculars, however, we questioned whether or not the dielectric prism coatings contributed as much to resolving details as they do with other Nikon binoculars. We consider the Monarch 5's resolution of details to be a solid average performance in its price range. As Nikon typically does with most of their binoculars, they've designed the Monarch 5's optics to include a small amount of pincushion distortion to avoid the "rolling ball" or "globe" distortion. "Rolling ball distortion" has the unpleasant ability to create nausea in those susceptible to it! We didn't notice a strong color bias in the Monarch 5 we bought and tested, but we did notice that chromatic aberration seemed relatively apparent. We noticed a blue&sol;purple fringe when observing dark wires or branches against a light background and a yellow&sol;green fringe on darkly colored parking lot lights against a bright sky. When viewing images without a bright background, it was not apparent and would be unlikely to be noticed. Was this chromatic aberration enough to be troublesome? That depends on what you're using it for to some extent. If you're using a Monarch 5 binocular to watch birds or planes in flight, for example, you may notice it more than someone who is typically using it for land or marine viewing. Manufacturers have found that a greater number of reflective dielectric coatings applied to a prism in a roof prism binocular will outperform a lesser number of dielectric coatings. To say it differently, a roof prism with 50 layers of dielectric coating (arbitrarily choosing numbers) will give a brighter, more highly resolved view with more contrast than one with only 10 layers. Just because dielectric coatings are used doesn't mean the performance will be the same as a binocular with a greater number of dielectric coatings. We felt that the Monarch 5 binocular we tested provided good performance in low light viewing, but not quite what we would expect from a dielectric prism coating. We felt it was good at its price point, but not necessarily better than a binocular which used a good silver alloy reflective coating. (You likely remember that silver alloy reflective coatings were the best binocular prism coatings available until dielectric coatings were developed relatively recently.) While we don't know how many dielectric layers Nikon uses on the prisms in its Monarch 5 binoculars, we're guessing it's fewer than in its binoculars at higher price points. 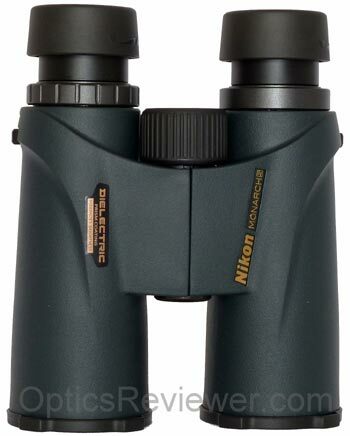 The fact that this binocular is fully multi-coated would also contributes to its low light functioning. This is a feature one might expect in the Monarch 5's category, but it bears mentioning just the same. The bottom line is that the Monarch 5's view is good — about the same as you'd get with a good silver alloy reflective coating applied to the prisms. The Monarch 5 binocular we tested did well when faced with strong light both during the day and at night. We were able to induce a nominal amount of glare under strong sunlight conditions when at narrow angles from the sun or from light reflected from water or other surface. It was better than average in this regard, however, and we are quite comfortable recommending it for use under such conditions. Nikon's specifications for each of the three Monarch 5 configurations is just 8.2ft (2.5m) for the minimum distance at which a sharp focus can be achieved. This is right at the minimum 8ft we recommend for bird watchers and we think it's good. We found that our Monarch 5's measured close focus distance was actually 7.6ft (2.3m) and even better for bird watchers. Historically, we've both held and expressed a clear preference for locking diopter adjustments. We still think they're the ideal, but realize the practical aspect of life, too. The main reason for locking a diopter adjustment is to keep the setting from being changed during use. That's the goal and if it can be achieved in another way at a reasonable cost, we're satisfied. The Monarch 5 binoculars' diopter adjustment is set using a ring around the right barrel ocular. Although the ring doesn't lock in place, Nikon has designed it to be very stiff to turn. We found that this kept the setting from "self-adjusting" while in use and was an effective approach to keeping the ring from turning accidently. Goal achieved! We're like kids in a candy store when we order binoculars and we're always interested to see what's in the box when we open it! 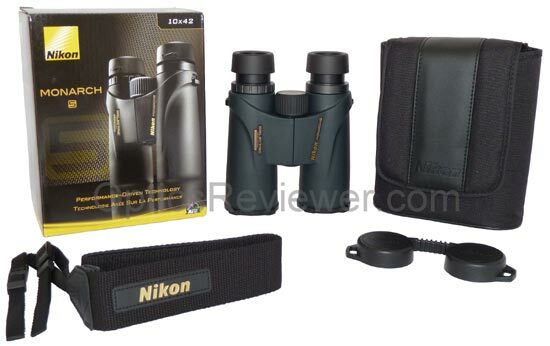 Nikon provides a nice carrying case with the Monarch 5 binoculars and it's a nice fit for them. It has what we perceive to be a vinyl-type of trim that goes from the bottom of the flap over the top of the case and partially down the back of it. The part of it on the back of the case has been stitched so as to provide a loop to run your belt or a strap through. We don't think that the vinyl-type material belt loop is strong enough to hold the binocular case with the weight of the binoculars and suppose that it was provided as a means of carrying the case while it is empty. The case does not have its own carrying strap, but rather the binocular's neck strap doubles as the carrying strap for both binocular and case when the binocular is in the case. We think the belt loop is a thoughtful feature. The neck strap is 1.5in (3.8cm) wide and feels like cotton webbing with a leatherette-type backing on the portion that will ride against one's neck and shoulders. We felt it was comfortable for holding the relatively light weight of the Monarch 5 binoculars. The box also contains a warranty registration card and the user manual. We feel the rain guard provided with the new Monarch binoculars is an improvement over the one provided with the Monarch ATB binoculars. It's a stiff plastic that stays put on the eyecups by being deep enough (about 0.5in/1.3cm) to slide down over the eyecups. The soft, rubberized surface of the eyecups provides enough friction that the rain guard isn't popping off when least expected or desired as the old ones were prone to doing. Is it perfect? Probably not — we suspect it might break sooner than it would if it were of a more rubber-based material. 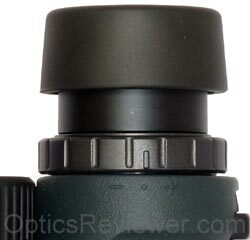 The covers for the objective lenses have done away with the problem of being lost due to falling off during use. The tethers for these stiff plastic covers clip into holes on the bottom of the barrels' armoring. Unfortunately, they don't stay put on the ends of the barrels any better than most lens covers. In fact, they typically unfasten from the end of the barrels when withdrawing them from the carrying case. They can be removed by snipping the tethers or (we assume) by taking them out of their sockets with a needle-nosed plier. Because they do provide some benefit, we felt it was worth leaving them in place and periodically pressing them on the ends of the barrels. 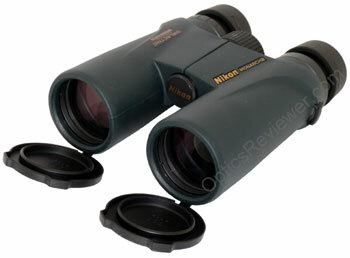 These Nikon Monarch 5 binoculars presented a decent value for the price when available new. We recommended them for those wanting a decent optical value. 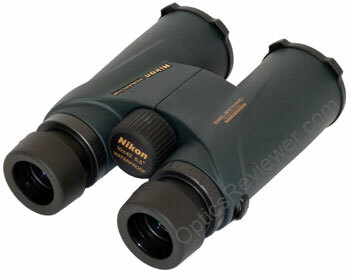 We included this Nikon Monarch 5 in a comparison with other binoculars in the same price range. Those wanting to get the best optics for their money will want to see our Nikon Monarch 5 comparison article. Since Nikon has replaced this binocular model with an enhanced/improved version, you'll likely want to check out our review of the replacement model — the Nikon Monarch 5 ED. It's our sense that it competes with a couple of other bincoculars you'll want to be aware of, too. What's the Nikon Binocular Warranty Like? Nikon's 25 Year Limited Plus No-fault Warranties provide very good protection for prospective owners. They cover the binoculars during the time that we would expect them to be at their best and functioning optimally. If your binocular should require a service or repair not covered under the limited warranty, you'll want to enclose $10 in with them and you'll be responsible for return shipping and handling. They're covered even if the problem was your own fault.